When you restore encrypted files or backups from tape, you need to specify a password that was used to encrypt data archived to tape. Insert encrypted tapes into the tape library. Catalog the tapes so that Veeam Backup & Replication can read data archived on tape. After you perform catalogization, encrypted tapes will be displayed under the Media > Encrypted node in the corresponding tape library. On the cataloged tape, Veeam Backup & Replication displays the key icon to mark it as encrypted. In the inventory pane, select the Encrypted node under Media node. In the working area, select the imported tape and click Specify password on the ribbon or right-click the tape and select Specify password. In the Description field of the Specify Password window, Veeam Backup & Replication displays a hint for the password that was used to encrypt the tape. Use the hint to recall the password. In the Password field, enter the password for the tape. If the imported tape is a part of a backup set but is not the last tape in this set, perform catalogization once again. When Veeam Backup & Replication creates a backup set, it writes catalog data to the last tape in this set. If the imported group of tapes contains the last tape in the backup set, Veeam Backup & Replication retrieves catalog data from the last tape during the initial catalogization process (see point 2 of this procedure). If the imported group of tapes does not contain the last tape in the backup set, Veeam Backup & Replication needs to additionally catalog files on imported tapes. If you enter a correct password, Veeam Backup & Replication will decrypt the tape media. The tape will be moved under the corresponding media pool in the inventory pane. You can perform restore operations for data archived to tape as usual. Password that was used to encrypt tapes in the media pool. Password for the primary backup job. After you enter the first password, backups from the tape will be moved under the Backup > Encrypted node in the inventory pane. You must then enter the second password to decrypt the backup and get access to its content. 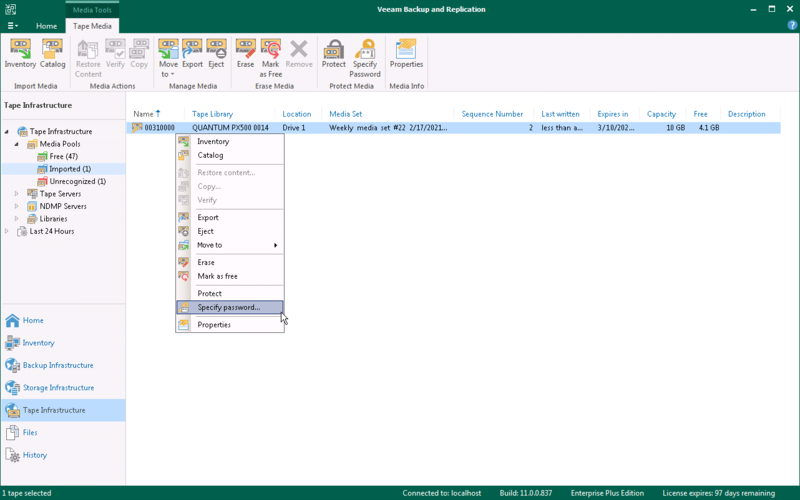 If you use Enterprise or Enterprise Plus Edition of Veeam Backup & Replication and your Veeam backup servers are connected to Veeam Backup Enterprise Manager, you can recover data from encrypted tapes even if the password is lost. For more information, see Decrypting Data Without Password.